How whimsical! 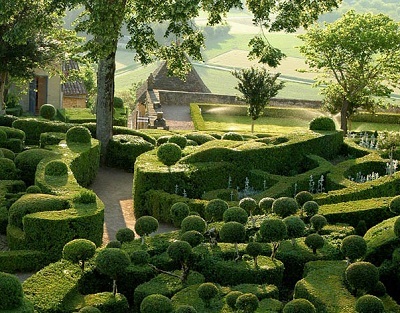 In one of the most unspoiled parts of Europe, deep in the former province of France in Périgord, there is a magical place called Gardens of Marqueyssac. 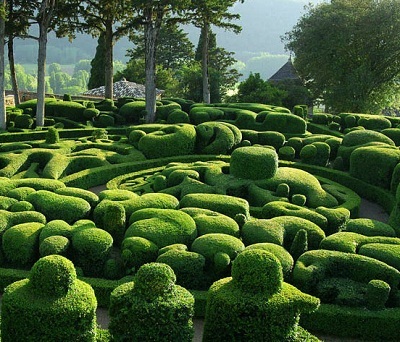 They were planted in 1861 by Julien De Cerval whose dream was to create a romantic experience for the visitors of the gardens, where they could get lost within the paths and enjoy the organic shapes of the plants. Each part was carefully thought out and planned to perfection. 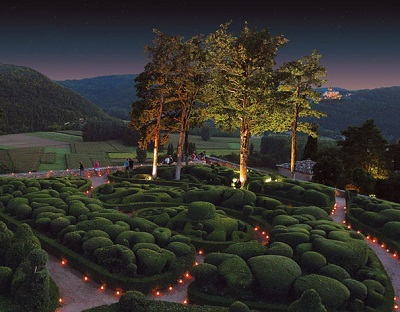 No fairytale garden would be complete without a dreamy chateâu - of course. During summer, each Thursday evening the gardens are candlelit and various musicians play concerts for visitors. They also have tons of fun stuff for kids including rock climbing, picnics and swings. If that wasn't enough, there is an area that meanders 130 meters above the river giving breathtaking views. Just by looking at those photos I’m dreaming about spending an afternoon sipping wine, listening to live music and taking in the mesmerizing views. Wow, that is beyond beautiful! oh my gosh hello straight out of alice in wonderland! Im buying a place ticket right now :) That would just be the best wedding spot ever! Oh so true, Emily. This place would make a fantastic wedding venue! This is one of my biggest dreams. Oh my! Oh my heavens! Forget Paris- I am going straight here next time. Lovely! que bonito y mágico lugar!!! so amazing. imagine the up keep! i so want to go to france some day. woah! looks like a fairytale! Oh my it is like a fairytale. I've been to France, but I would love to go back and see this place! Hahha..Tiffany:) Your comment made me laugh out loud. Amy, I read that they have a huge team of gardeners working daily to keep this place so beautiful. OMG! 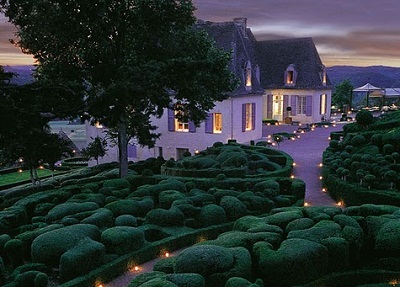 I haven't been to France yet, but this makes me wanna go now, and to this garden! 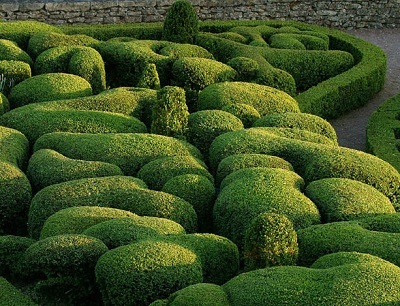 Those are amazingly whimiscial gardens!! its so beautiful!! That is gorgeous! I am going to Paris next week and I can't wait to see Paris at night! That is ENTIRELY too magical. WOW. Thanks for sharing these pics -- what an amazing place. let's go, that looks amazingly fun:) paris is on my list. I just love the beauty of nature and the forms and shapes it can take. This is truly wonderful and amazing! OoOoOooo... It looks nice at night! How fun, Kelly. You will have the best time in Paris:) It's so romantic at night. I would LOVE to go there! I still haven't been to France.